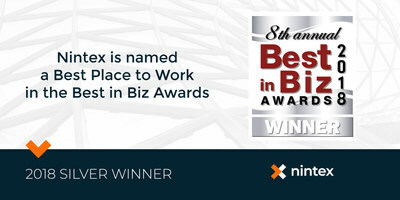 BELLEVUE, Wash., Nov. 28, 2018 /PRNewswire/ -- Nintex, the global standard in process management and automation, is pleased to announce it has been named a 2018 Best Place to Work by the Best in Biz Awards, an independent business awards program judged each year by editors and reporters from top-tier publications in North America. Nintex was recognized in the Best Place to Work - Medium Category (100-999 employees) with its nearly 500 employee global workforce. "Nintex employees are passionate about pursuing our mission of improving the way people work through process management and automation knowing that nearly every organization will benefit from the use of our technology," said Nintex CEO Eric Johnson. "We have a highly collaborative culture focused on the success of our partners and customers and are constantly looking for talented customer-centric team players to join our offices around the globe." Since the company's founding in 2006, Nintex employees have helped our partners and customers improve their business results by helping digitally transform their companies through process automation. The combined power and ease of use of the Nintex Platform, coupled with company's outstanding customer service and extensive global partner network, has led to more than 8,000 successful customers in more than 90 countries. For career opportunities at Nintex, including positions in Auckland, Bellevue, Dubai, Kuala Lumpur, London and Melbourne, please visit https://www.nintex.com/why-nintex/careers/.